Jacob's Ladder, Episodes 1 & 2: Gideon -- Episode 1: Gideon, Reluctant Hero: The Hebrew people have forgotten about the mighty God of their forefathers. They are being lulled into idol worship by the Midianite conquerors. God calls the young man Gideon to stand up to these oppressors and their false gods. This story will challenge you to lay aside your idols and worship the one true God. Episode 2: Gideon, Warrior by Faith: An angel has told Gideon he will free God's people from the Midianites. But, with no army and facing outrageous odds, Gideon finds it hard to believe and even harder to act on faith. Watch as God gives Gideon just what he needs to strengthen his faith. In the process, Gideon learns to depend on God to do the impossible. Jacob's Ladder, Episodes 3 & 4: Naomi, Ruth and Boaz -- Episode 3: Naomi and Ruth: A severe drought has brought famine to the land of Canaan. Elimelech and his wife, Naomi, have no choice but to leave all that they know and venture to Moab. There they are not welcome and new hardships await. Lessons about facing trials through faith and building healthy communities that reach out to outsiders come through in this powerful story where conflicting cultures clash. Episode 4: Ruth and Boaz: Naomi and her daughter-in-law, Ruth, arrive back in Canaan to face a harsh reality. With no home and no money, these two widows need a plan for survival. Hard work, the law of the Lord, and a steadfast faith will all play a part in their success. 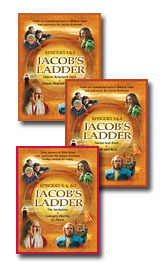 Jacob's Ladder, Episodes 5-7: Samuel -- Episode 5: The Invitation: Hannah has promised to give her son to God. Now that Sammy knows of his amazing birth, he must choose whether to accept God's plan for his life. Explore how free will interacts with following God's calling in this story. Episode 6: Samuel's Destiny - Part 1: As the priest Eli's righthand man, 13-year old Samuel works hard in the temple. Meanwhile Eli's two sons sink deeper into a life of sin. How will these contrasting choices impact the Hebrews and their covenant with God? Episode 7: Samuel's Destiny - Part 2: As he begins to hear from God, Samuel transitions into the role of prophet. Meanwhile, the Israelites are marching into battle with the Ark of the Covenant, but without the Lord of Lords. What will it take to convince them to repent and put their faith in God?